The automobile and the motion picture are two pieces of technology that entered the popular consciousness at the same point in history, and they’ve been entwined ever since. From the Keystone Cops to The Fast and the Furious (and perhaps to a lesser extent Grease, Christine, and Driving Miss Daisy), cars have become a quintessential cinematic touchstone to the point that they can define their own genre – and sometimes become the most memorable characters. Automobiles will instantly increase your project’s sense of scope, and it’s always a blast to see them go fast and crash into things. In this Production Primer, we’ll cover using cars in your next video project – the different ways you can write a car scene, what to consider when planning the shoot, and the basics of automotive cinematography. Buckle up. Cars, as objects, hold a great deal of psychological clout in our society. They’re instantly relatable as vessels for the drama and drudgery of our daily lives, as catalysts for quiet romance or high tension, and as symbols of speed, power, and freedom (or symbols of comic haplessness if your character is rocking a jalopy). Ultimately, they can also be symbols of danger and death. 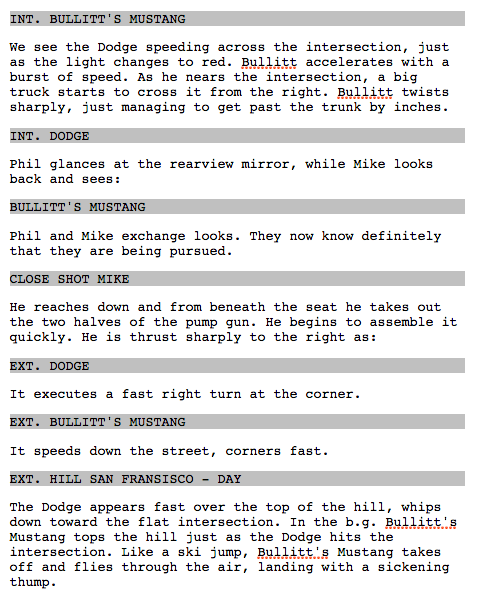 Adding a car scene to your script will pique a subconscious interest in the reader. After all, now the story’s on the road… who knows what could happen? There are three foundational types of car scenes to work with: Solos, Drive & Talks, and Chases. Solos are the most ubiquitous: one character, one vehicle, going somewhere. These scenes are typically intimate – your character will dominate their surroundings and be limited in their physicality. Solos are good for injecting moments of focus, reprieve, levity, or introspection into your story – just make sure that they serve a dramatic purpose. ‘They’re also convenient mechanisms for establishing the geography and tone of your setting and don’t require much page space to write. 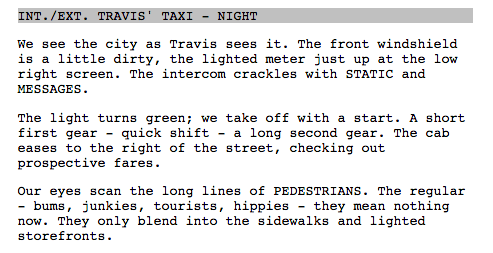 Compare this clip from Taxi Driver with how it appeared in Paul Schrader’s script. As for Drive & Talks, you’re probably already picturing one: your characters are in the car, driving along, having a conversation. If your characters are traveling from location to the next, why not exploit the change of scenery? Everyone knows that drives elicit a different kind of behaviour: passengers are more attuned to their environment, silences are less awkward, random observations are more frequent, and the lack of an easy exit influences the way people interact with each other. Try to keep these tendencies in mind when writing your Drive & Talk to cultivate a naturalistic feel. They’re a great opportunity for reveals, or to liven up stretches of expository dialogue. Finally, there’s the Chase. Chase scenes don’t necessarily need to be about pursuit and escape, but they do need to be about action, speed, danger, and stunts. In your writing, you’ll want to concentrate more on describing the physical action of driving and the movement of the vehicles, especially in relation to one another. Sketch out what you want to happen before going to the script editor (our Index Cards are a great for this), and use clean, telegraphic writing with punchy transitions to help your chase sequence unfold in the mind of your reader. For further reference, the legendary 1968 Steve McQueen vehicle (pun intended) Bullitt is a masterclass in car chases both on the page and the screen. Check out these excerpts from Alan Trustman’s script and the corresponding, legendary chase scene through the San Francisco hills. A shoot day featuring picture vehicles requires a great deal of advanced planning. Safety, liability, and legality should be at the front of your mind when setting out to shoot a car scene. There are some obvious fundamentals that need to be checked first: are your vehicles roadworthy and properly insured? Are your crew members and actors properly licensed to drive? Do you have an additional production vehicle for tailing, supervision, and moving key crew and equipment? Will road conditions be safe? If you’re planing on shooting a Solo or Drive & Talk that doesn’t call for potentially hazardous elements like crashes, distractions, heated arguments, fights, or high speeds then things get a little easier. Depending on how you choose to design your mounting setup, it’s quite legal in most places to drive around in a camera-rigged car. If you make sure that the driver’s view is unobstructed and that your equipment is properly secured, you should have no problems. If you are operating with a small team and lack the resources for blocking off streets or hiring flagging crews, try to scout out low-traffic areas with long, straightaway stretches and plenty of room for pulling over. If you think you are going to be shooting anything that might be remotely dangerous or cause a disruption on the road, you’d be well advised to obtain a shooting permit from the local municipality and plan accordingly. 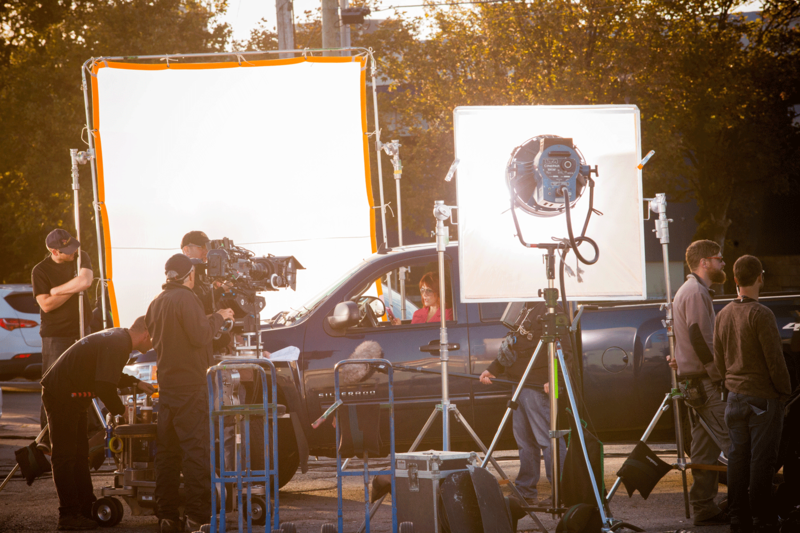 If your scene calls for daylight, aim to schedule it for mid-morning or mid-afternoon when the sun will be hitting the car at an angle. This will increase the amount of reflected light on the car and ensure a better exposure. If you’re planning to shoot at night, scout out well-lit areas. Lighting a street at night on your own requires some serious illumination firepower. Again, the less traffic, the better. When it comes to including stunt driving, chases, and crashes in your project, bear in mind that you’ll be elevating your entire production to a new financial level. You will need a Stunt Coordinator and Stunt Drivers. These people are seasoned professionals who know how to make cars perform for the cameras without getting people killed. Any stunt involving a car is extremely dangerous and calls for an arsenal of specialized safety equipment, permits, and crew members. If you think you can pull off a car stunt guerilla-style, don’t. The risks are simply not worth the reward, and the legal ramifications can be severe if something goes wrong. There is a way, however, to achieve a crash or an in-car karate fight without even having to turn the vehicle on – more on that later. The first step in shooting a car scene is designing your mounting setup. Camera mounts come in a wide variety of styles. For smaller cameras, suction-cup style mounts provide an easy way to affix your cameras to any flat, smooth surface on the car. Interior window mounts and door mounts are easy to install and manipulate, and allow you to create a multi-camera, full-coverage shooting setup inside the vehicle. This style of setup is excellent for filming Solos or Drive & Shoots; just be sure to position them so that the cameras cannot see each other (it’s not a great look). Regarding lighting, shoot for the previously mentioned mid-morning / mid-afternoon hours. If the light isn’t great (or if you’re shooting at night), LED lights such as the Kino MiniFlo offer an excellent solution due to their adjustable brightness and small size (plus you can power it through the vehicle’s electrical outlet). For shots from outside the vehicle, heavier suction mounts can be positioned on the hood, roof, or trunk. Whenever you’re setting a camera mount on a vehicle (especially on the exterior of a vehicle), “Secure” should be your mantra. Always test your rigging, and don’t always rely on the suction cups alone: if necessary, utilize ratchet straps, rope, and additional weights to make sure your rig isn’t going to go flying into traffic should a sudden stop occur. Stability is key to this kind of camera work, both inside and out: be sure to do several camera tests at various speeds to ensure that there isn’t excessive vibration in the shot. If the camera is shaking too much, it’s either too heavy for the mount, or the mount isn’t secured properly. Exterior shots also give rise to the issue of reflection on the car glass. If this occurs, try using polarizing filters, hoods, and flags to lessen the effect. You can also shoot exteriors from a different vehicle entirely. A “Camera Car” utilizing the same mounting systems described previously can follow your picture vehicle on the road. If you decide to use this method, make sure that your route is well-plotted and that all the drivers (actors included) know exactly where they’re going. The more complex you make your driving, and the more vehicles you involve, the more dangerous it gets. Always make safety the priority. Cameras, especially when mounted inside of vehicle, have an interesting tendency to exaggerate the speed that the vehicle is travelling due to the wonders of relativity. Therefore, you can achieve a high-speed look without breaking the speed limit. Wide angle lenses also intensify this effect. Directing your actors and operating the cameras can be tricky. It is possible to arrange the cameras so that the director and/or camera operator can be present in the picture vehicle without appearing in the shot. If this isn’t feasible, walkie-talkies and frequent stops will be a necessity. Finally, what if you really want a car crash but simply don’t have the budget? What if you want to do a long Drive & Talk but don’t have the gas money (or a driver’s license)? The Poor Man’s Process is a timeless filmmaking technique that offers a lot of room for flexibility and ingenuity – on the cheap. By having your actors sit in a vehicle surrounded by green screen, you can shoot car scenes without ever having to turn the key. Typically, lengths of wood are used as levers against the car’s frame and pumped up and down while lights are moved around or manipulated with flags and mirrors, simulating the vehicle being in motion while your actors pretend to drive (or crash). In post, the green screen is keyed out and appropriate footage composited in. Add some foley work and the illusion is complete. With careful planning and modern post-processing software, the effect can be quite seamless – and frees you up to try things that you might not be able to achieve on the open road.